Gelsenkirchen - When you have got the talent, age is irrelevant. That is precisely what FC Schalke 04 midfielder has emphasised in his short yet already noteworthy career. Since becoming the Royal Blues' youngest ever debutant in January 2011, there has been no turning back for a player who, on Matchday 33, broke through the 100-appearance barrier in Germany's top flight. At the age of 20 and 225 days, he is now the youngest player ever to rack up so many presences in the Bundesliga, having already played his 100th game in all competitions at the tender age of 19, two years on from his Schalke debut on 15 January 2011. 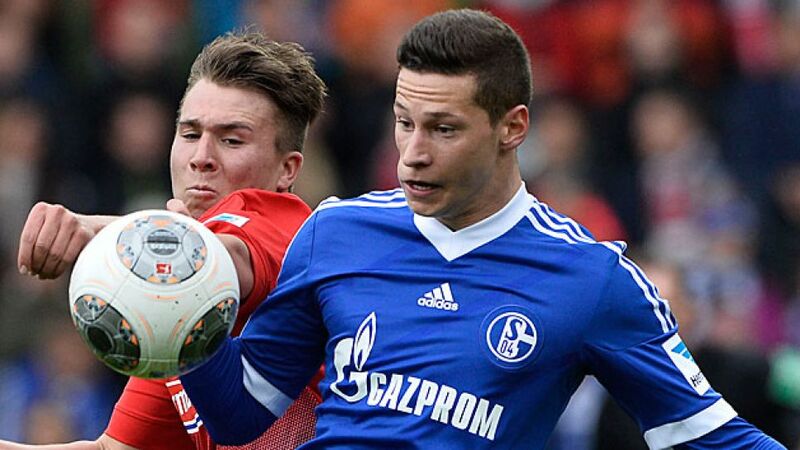 In that brief but productive period, Draxler has become one of the Bundesliga's most familiar faces. His first goal - on 1 April 2011 - made him the league's youngest ever scorer. A further 25 efforts have followed in all competitions since (a total of 14 in the Bundesliga), with few more important perhaps than this season's UEFA Champions League play-off strike that secured the Royal Blues their place in Europe's elite club competition at Greek outfit PAOK's expense. Fast forward nine months, and there would arguably be no better time for him to repeat the trick and end a current league goalscoring drought than on Matchday 34. Draxler has not found the net in 1213 minutes of Bundesliga fare, a run of 15 games, but after starting the season off with such a priceless hit, the Germany international is now in a position to round off Schalke's season with a similarly invaluable goal this Saturday. The Gelsenkirchen club need just to avoid defeat against relegation-threatened 1. FC Nürnberg at the weekend to clinch their place in the group stage of next year's Champions League, and avoid the need for a nail-biting play-off like last term. However, when you have Draxler in your side, such a prospect is no longer so formidable. "What we need from him is that special something, which he no doubt has," said his coach Jens Keller on the subject of the German hotshot's recent dip in form. "He's changed his game, which is right, and he continues to have top values in terms of distance covered, but his creative momentum has fallen by the wayside a little. I've told him he mustn't neglect his footballing skills. He's been lacking courage in decisive situations. I've shown him some videos and he sees things the same way." Far from kicking a man when he's down, Keller just wanted to remind Draxler of exactly what has made him such a big name, and why the expectations atop his ever-maturing shoulders have grown exponentially in such a short space of time. Schalke and Germany's youngest Champions League goalscorer, the Royal Blues' top assist provider (six in 2013/14) and a first-team regular of three years: he may have already achieved a lot, but there is still plenty more to come.